Marvin is originally from Flores, Petén. He was selected as a GOJoven Fellow when he was 23 years old. Marvin is a young activist, coordinator, and promoter of Sexual and Reproductive Health (SRH). He has facilitated discussion of topics such as SRH, advocacy, leadership and Integral Education in Sexuality. He is currently a volunteer at Asociación Tan Ux’il, and is part of a modern dance group in his municipality. 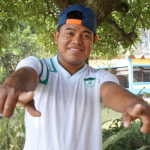 Since 2016, he has served as a coordinator of community promoters in the municipality of San Francisco, Petén, where he promotes Sexual and Reproductive rights among adolescents and young people.